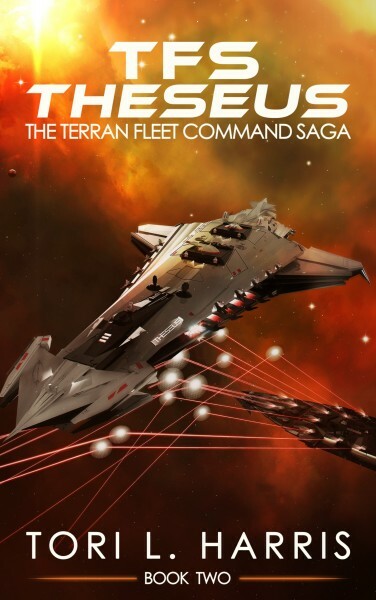 Version 1.1 of TFS Theseus – The Terran Fleet Command Saga, Book 2 is now available for download via your "Manage my Kindle" page. The update corrects a few minor items that managed to slip through the editing process, but no significant story line changes were made. If you are unsure which version you have, you can find the version number on your book's copyright page. Great read, can’t wait to see where this is going. Thanks, Scott! Very happy to hear that you are enjoying the story. If you haven’t already done so, I would really appreciate a quick review on Amazon! Ready to purchase the next installment. Your writing style, character development, and fast paced action is perfect in my mind. I can’t wait to see where we are going! Excellent series! Thank you very much, Dow, for your kind words. It’s always great to hear from happy readers! I’m sitting here busily typing away on book three and hope to have it available by late summer / early fall. Tori, will you release an audio copy of TFS THESEUS as you did with TFS INGENUITY? Loved the first book and can’t wait till a audio book companion to the book itself. I personally like to have both the kindle copy and audio voiced copy too. Hi CJ! I’m in the process of working with Podium Publishing on the second audiobook and just sent them all of the pronunciations last week (there were quite a few this time). They expect to do their recording sessions towards the end of this month. Unfortunately, the process takes a while to complete. Audible itself takes about a month to make the book available after they have all of the information from the publishing company (weird, huh?). Anyway, I expect the second audiobook to be available sometime this summer. Thank you very much for reading / listening and I’m very happy to hear that you are enjoying the story so far! Hi Kanel! I’m happy to hear that you are enjoying the story. One of my readers had an interesting point regarding cliffhangers being more difficult to tolerate when using e-reader devices. Her theory was that they are worse, simply because the reader isn’t expecting the end of the story like they would be with a physical book. Otherwise, I have to admit that I’m a little mystified regarding some of the negative comments I’ve seen on Amazon. Sure, a cliffhanger ending can make the reader have that “Awww Man!” moment, but it also keeps the story alive in their mind and (hopefully) makes them interested in the next book. It’s very frustrating as an author to see someone leave a negative review where they indicate that they enjoyed the story otherwise, but gave it a reduced rating because it had a cliffhanger ending … particularly since the story is clearly part of an ongoing series and after the first book ended in almost exactly the same fashion. It just seems to me that tying up a book that’s part of a series with a nice, tidy ending leaves the reader very little incentive to read the next book … and readers need to keep in mind that most authors aren’t writing these books just for the fun of it! 🙂 Having said all of that, I do expect that book three will reach … if not an ending, then something like a natural pause in the story line.